With Vernon Adams safely in the confines of Oregon’s locker room, head coach Mark Helfrich & Co. can stare slightly into the future without angst. Beyond the practice fields, the recruiting lull that shrouds the early part of fall is already beginning to lift as several recruits have sprung from the woodwork with future plans. Oregon’s receiver corps has been an early storyline out of Eugene, and the prowess of what usually is an underrated unit is beginning to spread. West Coast route runner Javon McKinley (4-Star/Corona, Calif./Rivals100) has been keen on Oregon for some time, and thus will motivate the sure-handed prep to visit the Ducks on an official visit in the beginning of November. At 6’2, 205 lbs., McKinley continues to grow in stature — a scary thought for opposing defenses, considering the style of play he excels at. McKinley, however, seems poised to take his time in the final stages of his recruitment. A strong showing from the receiver’s headman, Matt Lubick, could propel Oregon into the driver’s seat. Stay tuned! In-state trench warrior Anouson Keobounnam (NR/Gresham, Ore.) was on hand to take in Oregon’s practice this past Saturday, which is his second unofficial visit to Eugene in the past eight weeks. The 6’3, 275 lb. Keobounnam is no secret to offensive line coach, Steve Greatwood. 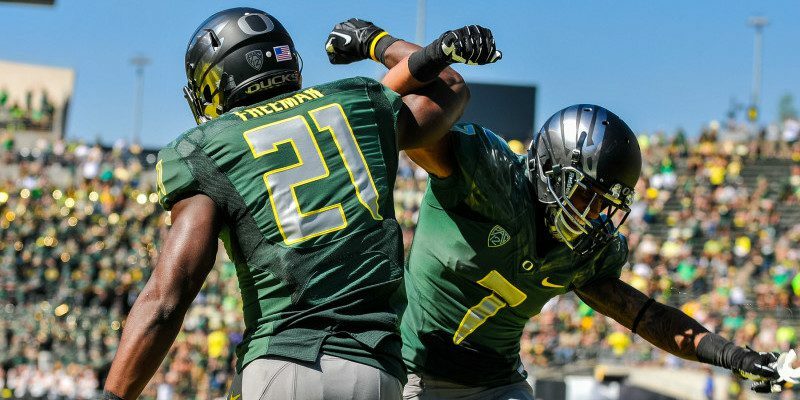 Oregon will do its final homework on the homegrown behemoth and potentially make an offer once an evaluation has been made. Greatwood usually keeps his targets close and continued dialogue would only seem to confirm an eventual nod, if Keobounnam continues to perform.